Get $25 eatigo cash voucher & earn Clubpoints from us! Exclusively for The Club members: Get $25 eatigo cash voucher & earn Clubpoints! Exclusively for The Club members! 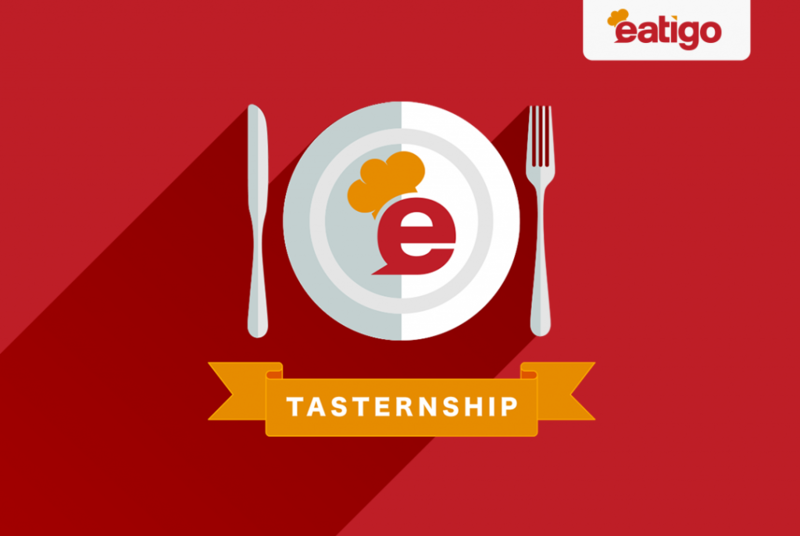 Enjoy standard dining discount with eatigo, and earn $25 eatigo cash voucher & Clubpoints at the same time. 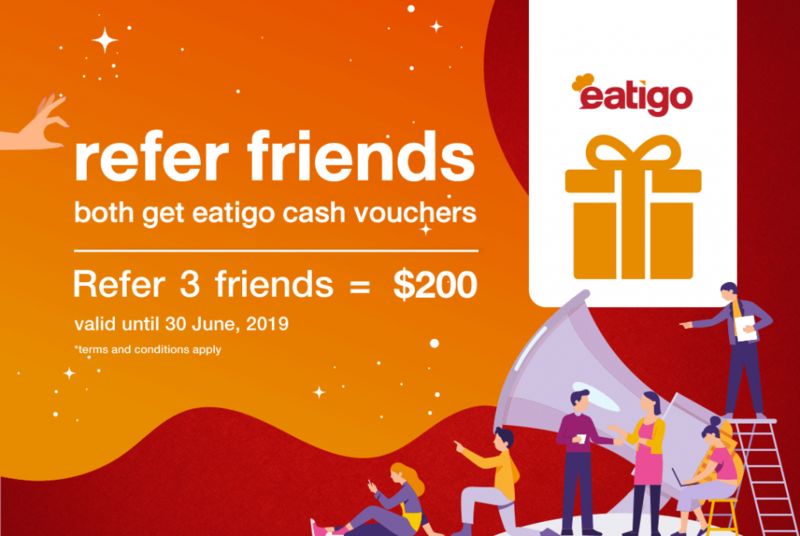 From NOW to 30th April, 2019 book with below promo codes, new eatigo users can get instant $25 cash discount and earn 100 Clubpoints by attending first table reservation. 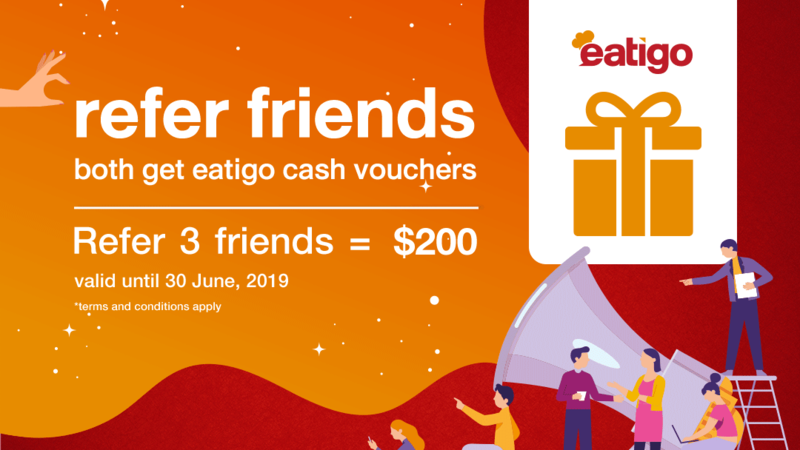 Even if you’re our existing user, you can still get $25 eatigo cash voucher for your next reservation and earn 50 Clubpoints upon your attended reservation! You will receive “eatigo x The Club: Clubpoints earning” Email, with a official form link to fill in The Club membership number. within 72 hours after attending the reservation. Fill in the necessary information and membership number to submit the form in order to claim the Clubpoint Rewards within 14 days. 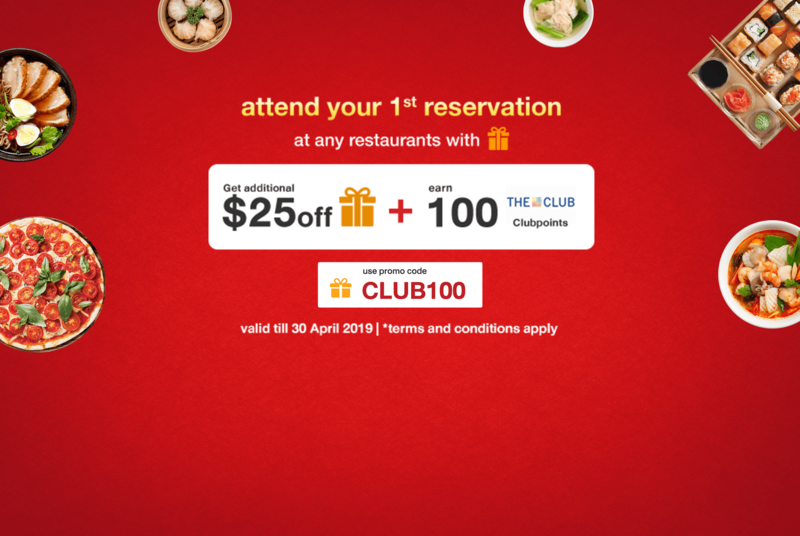 Book with promo code【TC50APR】and attend by 30th April 2019 to get $25 eatigo cash voucher for your next reservation & 50 Clubpoints. *Promo code to be updated every month. 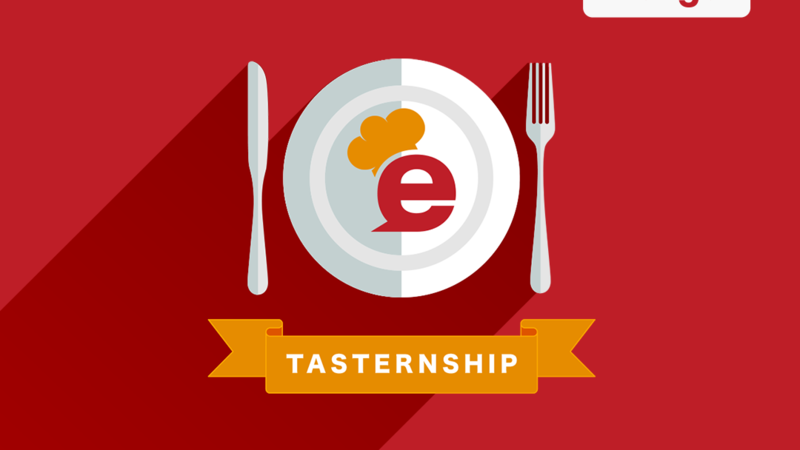 Available at www.eatigo.com or Eatigo app available on both iOS and Android! Promo code is applicable at eatigo.com and the eatigo app only, and must be entered at the confirmation page. The promo code 【CLUB100】 is valid from today to 30th April, 2019. This code is valid for new registered or first-time users only and can only be used once per eligible user for attended reservation. The promo code 【TC50APR】is valid from today to 30th April, 2019. This code is limited to a pre-defined quota of 2000 and will apply on a first-come-first-served basis. Each eligible user can enter code twice per month. The promo code of【TC50APR】will be updated monthly during the Promotion Period. To be eligible for the promotion, each reservation must be attended by at least TWO persons. All reservations must result in dining completion by 30th Apr 2019. To be eligible for this promotion, please keep the dining receipts or credit card transaction slips for verification purpose. Eatigo Hong Kong reserves the right to verify the payment proof and to disqualify against any user who fails to submit such. All outlets of following restaurants are excluded from this promotion: Triple O’s, Tea Library, T-Parc, One T Spoon, Chali @ Hysan, Mount Fruity. The Club Member will receive “eatigo x The Club: Clubpoints earning” from eatigo within 72 hours after achieving dining completion. The Club Members are required to click to the link and fill in the official form to submit accurate information including table booking code and The Club membership number. Only valid email addresses registered with eatigo are eligible for this promotion. 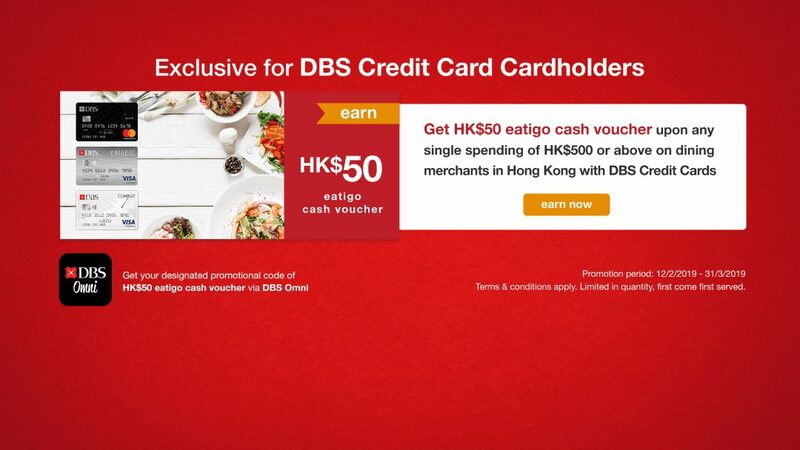 This promotion is valid only for eatigo users residing in Hong Kong. Eatigo Hong Kong reserves the right to amend or cancel the promotion at any time. In case of any dispute, Eatigo Hong Kong reserves the right of final decision. In order to qualify for this Clubpoints offer (“Clubpoints Offer”), you must be a member of The Club, a loyalty program operated by Club HKT Limited (“The Club”). Only members of The Club who register for eatigo membership will be eligible for this Clubpoints Offer. Members of The Club who already hold eatigo membership are entitled to the Clubpoints Offer after Dining Completion. The promo-code is applicable only via eatigo website and the eatigo app, and must be entered on the booking confirmation page. Only members of The Club making a table reservation via the eatigo website or app, achieving Dining Completion and providing valid information relating to the table reservation and a membership number for The Club are eligible to earn Clubpoints. Members of The Club will receive an “eatigo x The Club: Clubpoints earning” email from eatigo within 72 hours after Dining Completion. Members of The Club are required to click the link and complete an official form to submit accurate information including a table booking code and membership number for The Club within 14 days from the date of the email. If a valid membership number for The Club or table booking code is not provided on the official form within the appointed period, Clubpoints will not be awarded. Only valid email addresses registered with eatigo are eligible for this Clubpoints Offer. Clubpoints will be credited to a valid member’s account within six to eight weeks after Dining Completion. Eatigo Hong Kong Limited is the entity that will deal directly with members of The Club. The Clubpoints Offer is open only to members of The Club and eatigo users residing in Hong Kong. Clubpoints cannot be exchanged for cash or cash equivalents. The Club shall not be responsible or liable for the quality of, or any other matter relating to the products and services provided by Eatigo Hong Kong Limited, which is solely responsible for all obligations and liabilities relating to provision of its products and services. eatigo does not in any way (directly or indirectly or in conjunction with any party) own, manage, operate or control any of the restaurants listed on its website or app. Members of The Club shall be deemed to have accepted any risks and liabilities in whatsoever nature associated with eatigo’s restaurant reservation service. 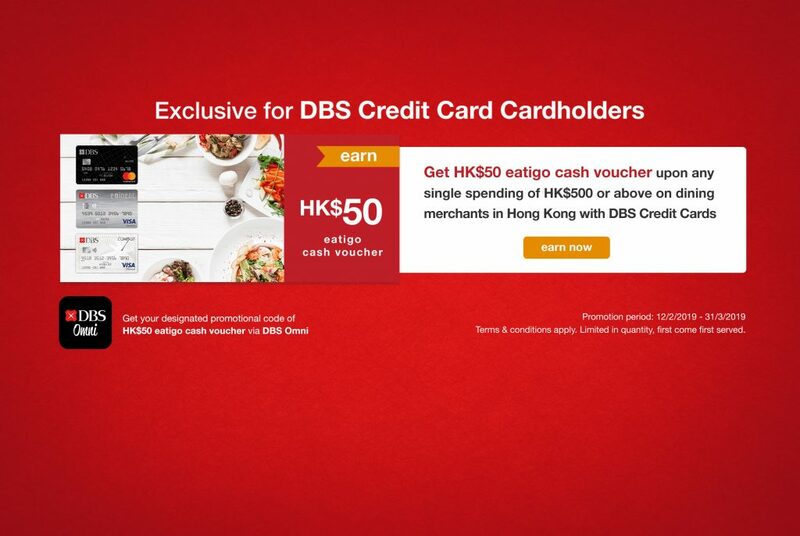 Terms & Conditions apply as dictated by Club HKT Limited and Eatigo Hong Kong Limited. Club HKT Limited and Eatigo Hong Kong Limited reserve the right to vary or cancel the promotion and/or amend or alter these Terms & Conditions periodically without notices. In the event of dispute, decisions made by Club HKT Limited and Eatigo Hong Kong Limited shall be final and binding. For inquiries and more details, please visit www.theclub.com.hk or call The Club’s service hotline on 183 3000. In the event of discrepancy between the English and Chinese versions, the English shall prevail. Earn more eatigo cash vouchers this April to June!